It was a great day for Ireland at today’s Manx Grand Prix with Andrew Farrell following up James Chawke’s Junior win earlier in the day with victory in the today’s MGP Supporters Club Lightweight MGP Race. Indeed Ireland enjoyed a lock out on the Lightweight podium with Irish riders taking the first three places. In the concurrent Ultra Lightweight, Northern Ireland’s Darryl Tweed put the disappointment of retiring from the morning’s Junior MGP Race while running third to win the Ultra Lightweight Class. 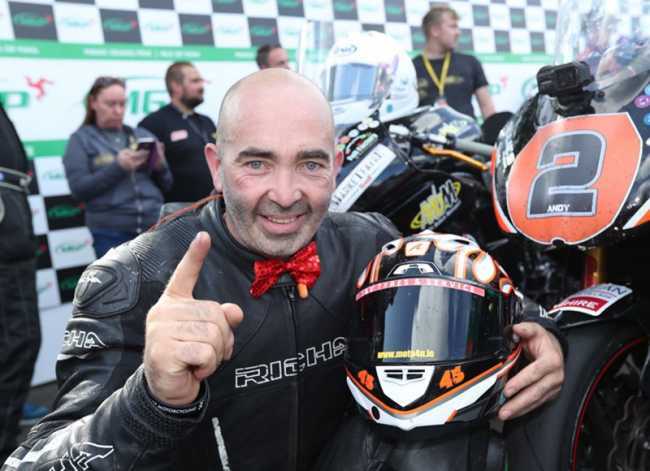 The delay to the second day race programme for the Manx Grand Prix saw Clerk of the Course Gary Thompson reduce the 4 lap Lightweight Race to three laps and he also introduced a compulsory ‘stop and go’ pit stop, regardless of refuelling requirements. Spain’s Victor Lopez Santos, who was the fastest qualifier in the Lightweight class, also had the honour of carrying the number one plate and being first away from the line on Glencrutchery Road at the revised start time of 2.45pm. Coincidentally the second man away – Andrew Farrell - was also the second fastest qualifier. However, James Chawke, fresh from his victory in the earlier MGP Junior Race, was fastest to Glen Helen, albeit by only three tenths of a second with Gary Vines a further 1.6 seconds back in third. Lopes Santos, leading on the road, was a further 2.5 seconds back in fourth with Lumsden just over a second behind the Spanish rider in fifth. Farrell, runner up in the Lightweight Race in 2017, was looking to go one better this year and was in front on the road and looking to get into Chawke’s lead which had now increased to 2.5 seconds. Whether it was the extra power of the Kawasaki over the Mountain or the clear road but Farrell had moved in front of Chawke’s to lead by three seconds at the Grandstand with his opening lap of 114.060 to Chawke’s 113.776 with Vines (113.660) almost a further second back in third and Lopez Santos and Lumsden completing the top five. However, shortly after, Lopez Santos was reported as a retirement at Greeba Bridge on his second lap. The same pattern emerged between the leading pair on the second lap with Chawke faster on the run to Ramsey, cutting the gap to the race leader to less than half a second but then Farrell again powered over the mountain to lead by 7.8 seconds after the second lap. Vines retired from the race at the 33rd milestone which saw Lumsden move into the final podium place at the Grandstand. Farrell was also much faster in the pits – almost nine seconds quicker than Chawke - which saw Farrell extend his lead to twenty seconds at Glen Helen on the third, and now final, lap. Farrell duly held on with a last lap of 110.239 to win by almost sixteen seconds from Chawke with Lumsden claiming the final podium position with his last lap of 109.825. In the concurrent Ultra Lightweight Race Darryl Tweed, who was the fastest qualifier, was already 11 seconds ahead of Alex Sinclair at Glen Helen on his opening lap with Daniel Ingham in third but already sixteen seconds behind the race leader. Tweed’s opening lap of 106.453 gave him a commanding lead of almost 24 seconds over Alex Sinclar with Daniel Ingham a further five seconds back in third. Coming in to the pits at the end of the second lap Tweed had extended the gap over Sinclair decisively to almost a minute but behind him Ingham had closed on the second placed man to only 0.3 seconds. Ingham enjoyed a faster pit stop than Sinclair and Ingham had an eight second lead over Sinclair at Glen Helen on the third and last lap but at the front Tweed was out in front on his own with a gap of 48 seconds. Tweed took the chequered flag with a last lap of 103.293 to win by well over a minute from Daniel Ingham with Alex Sinclair clinching the final podium place.